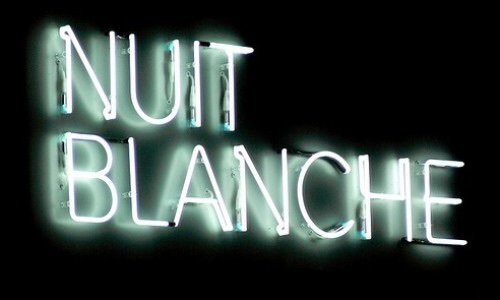 As promised… our collaborative class review of Toronto’s Nuit Blanche 2014! In my last post I talked about a review essay my performance studies students and I co-wrote for the brand-new issue of Canadian Theatre Review, sharing a bit about our working process and a few excerpts from the piece. Now, I’m happy to announce that the editor in chief of CTR, my good friend Laura Levin, has green-lighted my sharing the entire, published review here on the blog. Hooray! Below is a link to the official PDF of the review; if you decide to share it or to cite it yourself, please note that it comes from Canadian Theatre Review 163 (Summer 2015). For those who don’t work in theatre and performance in Canada, CTR is the country’s leading crossover theatre magazine, meaning that it publishes a healthy mix of scholarly pieces, interviews, a substantial amount of writing by artists, as well as original scripts, book and performance reviews in each issue. Issues are themed, and the vast majority are guest-edited. This particular issue, titled “Performance Futures: Imagining Theatre in 2030”, was edited by Jenn Stephenson and Laura Levin, and is well worth a look in its entirety if you have the time and inclination (check out the full table of contents here). Here we are, middle of August: the garden is heaving, the dog wilts in the heat, and I struggle to get back to work, scramble to get caught up on all the things that lingered, unimportant and in another world, while I was away this summer. Of course (of course! ), that includes preparations for another year’s teaching. Because this always happens – because I always end up leaving my teaching prep to August, and thus to spurts of freaking out alongside panicked coffee drinking – this past May I spent time reflecting on the year just ended in an effort to give my late summer self a leg up. (If you missed the three linked posts on this topic, start here.) As I now look to the work of prep (immediately!) ahead, I’m really hoping these reflections turn out to be the time and stress-saving gift from my early-summer self that I intended them to be. It’s like the universe knows where I’m going: last Wednesday, and as if on cue, another gift from last term landed on my doorstep. It was the new issue of Canadian Theatre Review (aptly titled “Performance Futures”! 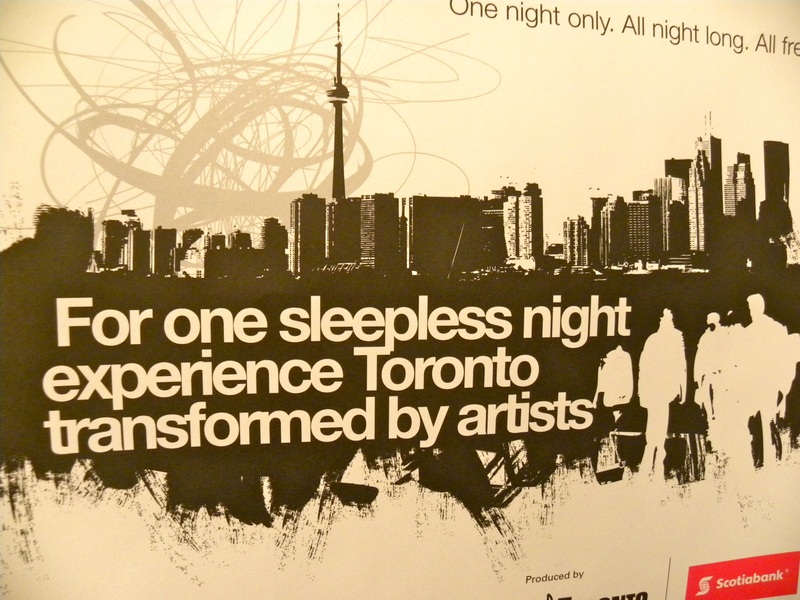 ), featuring my performance studies students’ review of the 2014 Nuit Blanche festival in Toronto. We traveled to the festival together last September, and when we returned we had a long, thoughtful, provocative, discussion about what we had seen: about our euphoria at the works that drew us in and made us stay, even through the gathering cold of an autumn night; about our disappointment over and mistrust towards commercial displays masquerading as art; about the poverty of installations that tried too hard, and often too superficially, to involve us; and about the ways in which the festival’s capitalist underpinnings are both unavoidable, and yet at times strangely inspirational for artists and spectators alike. Moved by the students’ obvious and profound learning from the field trip, I decided to approach my friend and colleague Paul Halferty, CTR‘s Views and Reviews editor, to see if he might be interested in publishing the class’s writing about Nuit Blanche. He said yes, and our class review project was born. What performances most moved me? Which felt underwhelming to me? When did I see myself, as a spectator, in the performance frame? We agreed that each pair would draft about 500 words, then bring that writing to an editorial meeting with me. I’d offer feedback and ask for rewrites; after that second round of work was complete the students would hand their texts back over to me and I would put all three chunks together, alongside a curatorial note in my own voice. During this putting-together phase I would also do some line editing of the students’ work, and then I’d pass it back to them to make any further changes they might like. Collaborating with my undergraduate students proved a welcome challenge, but a challenge all the same. I quickly realized that I needed to find a way to balance their relative lack of skill in writing for publication against the journal’s need for a polished final product. That meant I was juggling the (important, absolutely central) work of teaching them how to craft their thoughts clearly, concisely and for a wide audience with the work of an editor whose primary job was to ensure consistency of voice and argument. (I have new and profound respect for my colleagues who teach in Writing Studies, part of my home department at Western.) Hardest of all for me, it turns out, was honouring the students’ own words, phrases, and ideas while editing: shaping the whole while tweaking for clarity and grammatical accuracy, I often felt like I was writing over their voices. I wanted to ensure the journal was happy; I also, though, wanted the students to be able to open their copies of the published review and know those words on the page came from them. Making both of these things happen in appropriate measure was tough. In the end, I think we did a fairly good job of walking this tightrope act. All five students who participated (the class had seven students in total) were committed to the work and happy to take my advice and suggestions at the first draft stage. They responded quickly to my editorial queries, and they all sent their publication contracts back to the press’s administrator on time (NB: most career academics can’t manage that!). They were pros, in other words, and I’m enormously proud of them, and of what we have accomplished with this piece as a team. I want very much to be able to share the whole review with you on the blog, but I’m currently waiting for advice from the journal’s editors about whether or not I’ll be permitted to do so under the University of Toronto Press’s copyright regulations. As soon as I get a green light (assuming one is forthcoming), I’ll repost the piece here in full. In the meantime, below I’m including a couple of excerpts, as well as two fantastic photos from our favourite 2014 installation, HOLOSCENES. Meanwhile, if anyone wants to read the whole review but does not have access to CTR through their institution’s library or through a private subscription, please just send me an email and I will get you a copy. Finally, a question for the community: who has worked on publishing projects with undergraduates (or younger students) before? What strategies have worked well to ensure balance across all of the expectations in the mix? What challenges have arisen and how have you handled them? Please do share your thoughts in the comments – this is something I want to do more of and am keen for advice on best practices. Caitlin Austin and Rita Kim: While doing our online research on the Nuit Blanche website many of us shortlisted HOLOSCENES, and we were, as a group, mesmerized by this performance. It featured an enormous, aquarium-like tank that was constantly filled with or drained of water while within it performers attempted to accomplish such everyday tasks as gathering fruit into a basket or cleaning windows with a squeegee. 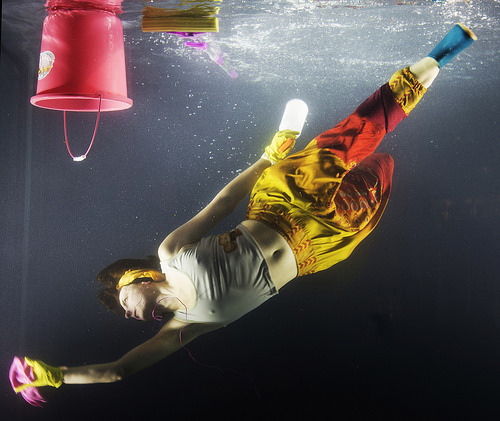 Light shone through the tank like sunlight through the ocean; the performers’ f lowing garments danced and fell through the rising and falling water. The performance seemed ethereal; it captivated, but it also managed to pose challenging questions: how should we watch and understand its central actions? 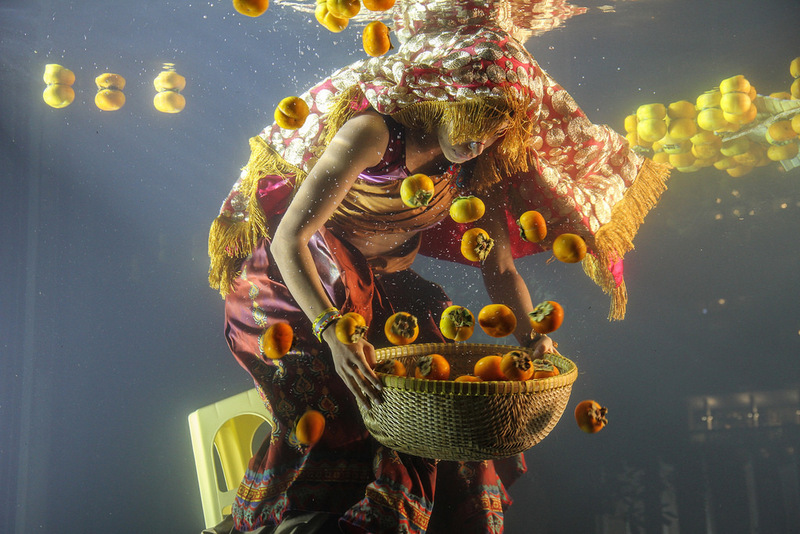 Jonas Trottier and Kat Dos Santos: The performers inside the tank acted out simple forms of labour that, in our culture, have negative stigma attached to them: fruit-gathering and windowcleaning are the jobs we associate with the poor and uneducated. As the tank filled with water, however, these tasks took on an otherworldly quality. With the addition of the light and water, the very mundane, even abject, actions that made up this performance were transformed into the dances of angels. Caitlin and Rita: Though the weather was chilly, no one among us dared to walk away from HOLOSCENES. In our discussions later, we found that we shared a feeling that, for some reason, we owed the performers our time, the respect of good spectatorship. Despite the freezing weather and our tired feet, we stood there for close to an hour. We acknowledged that the perpetual action of filling and draining water and the cyclical nature of the performance left us craving a finale. We had hoped for some kind of dramaturgical closure that would give us “permission” to walk away. Jonas and Kat: Reflecting on what we had seen, some among us expressed concern as to whether HOLOSCENES was problematic in the way it glamourized the work of day labourers. While this performance did “lift” such work up to our view, inviting us to appreciate an underlying beauty in it, it also put forward an image of manual labour that reinforced preconceived ideas and stereotypes. When the water drained from the tank and the performers were left soaked and shivering, HOLOSCENES offered us a firm reminder of why this type of labour remains stigmatised. 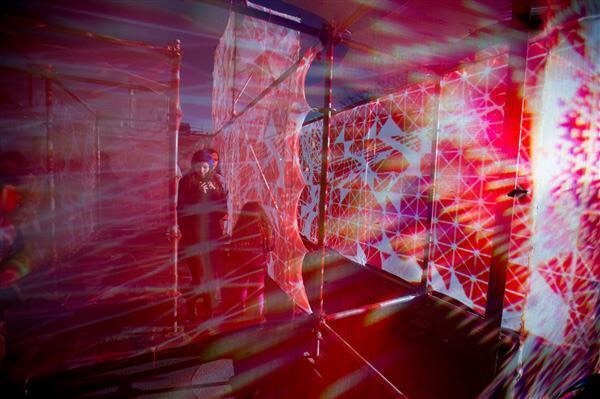 Sarah Gilpin: Despite our experiences at HOLOSCENES, it was obvious to us by the end of the night that Nuit Blanche is a consumer-driven event. I paid special attention to how some companies were using the festival as a cynical opportunity to draw crowds into their stores. 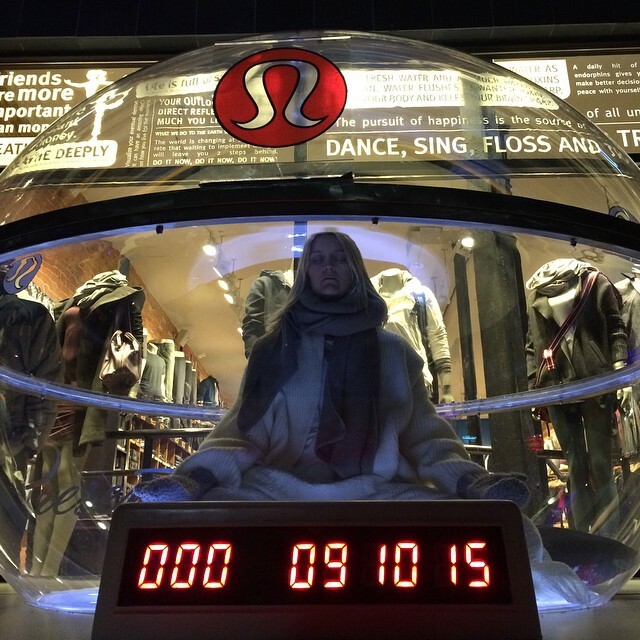 Lululemon is a good example: outside its Queen Street shop we saw a performance of a woman meditating, apparently for the duration of the night, in a large bubble. The female “actor” was required to remain perfectly still inside her bubble, mirroring a mannequin, while Lululemon’s storefront offered a ready-made frame (Goffman) for the business to lure in customers who obviously intended art, not yoga gear, to be their primary focus of attention. I did some research and discovered that Lululemon’s “bubble” was not a registered Nuit Blanche event; the company clearly chose to use the appeal of the festival to pretend it was offering its customers more than just retail goods for sale. For me, the storefront performance created unease, as it undermined the sincerity of Nuit Blanche’s larger frame. Were we being marketed to at every performance? we began to wonder. Walking past the shop later in the evening, our group discovered that Lululemon didn’t really intend their performance to be credible: though it pretended to be a 12-hour meditation by one individual, by the end of the night there was plainly a different performer in the bubble bearing the Lululemon logo. 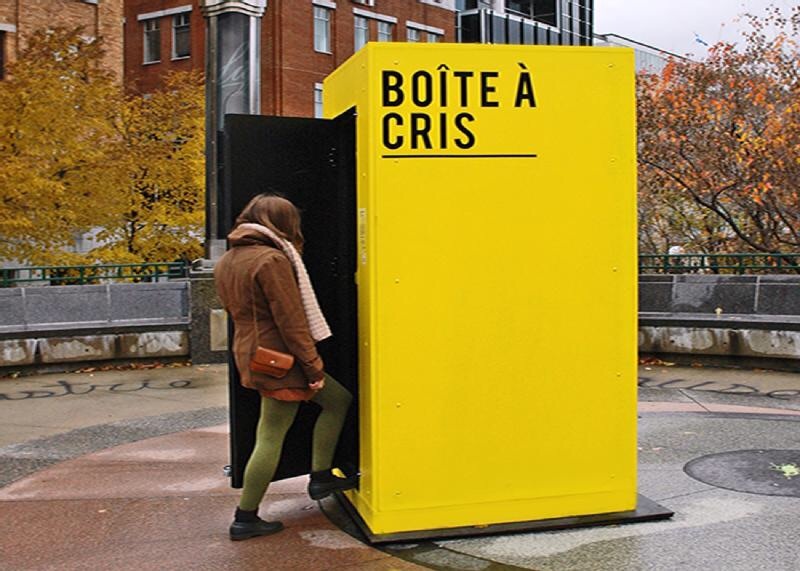 Caitlin and Rita: After reflecting on both the good and the bad of our experiences at Nuit Blanche, we realized that, on the whole, the pieces that depended less on spectators’ scripted “buyin” paradoxically allowed us to interact with them on a more meaningful level, provoking critical engagement that the more obvious participatory events actually shut down. Performances that invited us to do something specific, such as the flashy AMAZE, were less memorable than those more open and ambivalent in their invitation. 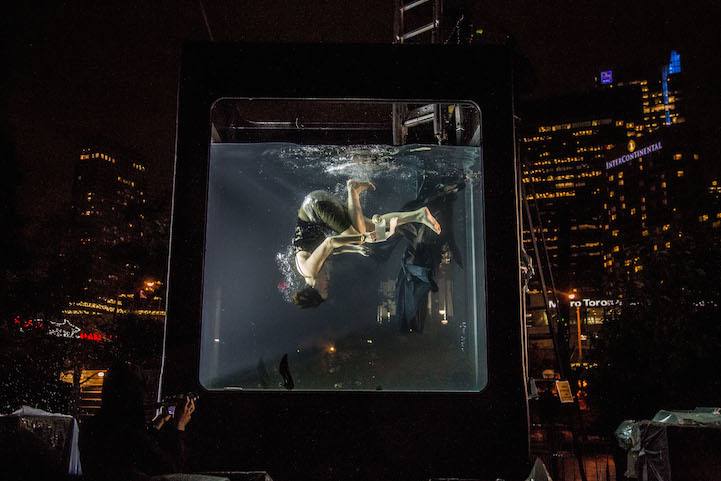 What stayed with us were the pieces that challenged our ideas about what it means to be an “active” participant at an event like Scotiabank Nuit Blanche and in a “creative city” like Toronto.